I love the designer George Nelson (1908-1986). His beautifully clean, functional, unpretentious designs are classics today, and they haven't lost a step. Nelson was a visionary. Not only was he a great designer himself, but he was an important writer on design and, as the company's head designer, he made Herman Miller one of the most innovative furniture companies ever, enlisting such designers as Charles Eames, Isamu Noguchi, and Buckminster Fuller. 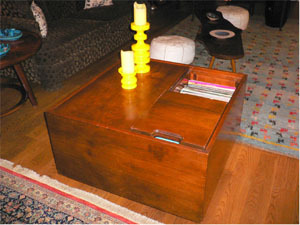 In my city pad we've got two leather-covered Nelson side tables and what is often called a blanket chest, but seems to be an LP cabinet. In the photo here it's opening, revealing a stash of Jamaican dub and antique hip-hop. At the country place we have even more Nelson furniture—dressers, a vanity, and his old hi-fi cabinet which still looks modern but quaintly has one speaker opening—it predates stereo. Well, you can imagine how pleased I was to discover at Undefeated, L.A.'s premiere sneaker shop, this pair of Vans made with fabric designed by George Nelson. I think they cost $65. 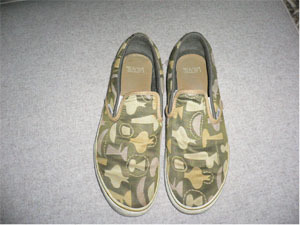 Maybe I can talk Vans into making up some slip-ons with the Josef Frank remnants I have laying around.